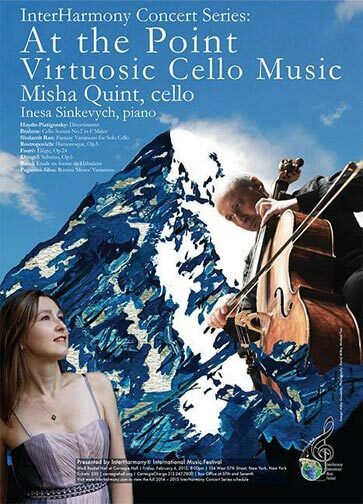 Cellist Misha Quint presents the best and brightest of the InterHarmony® International Music Festival on April 1, 2016 at 8 pm in the Weill Recital Hall. 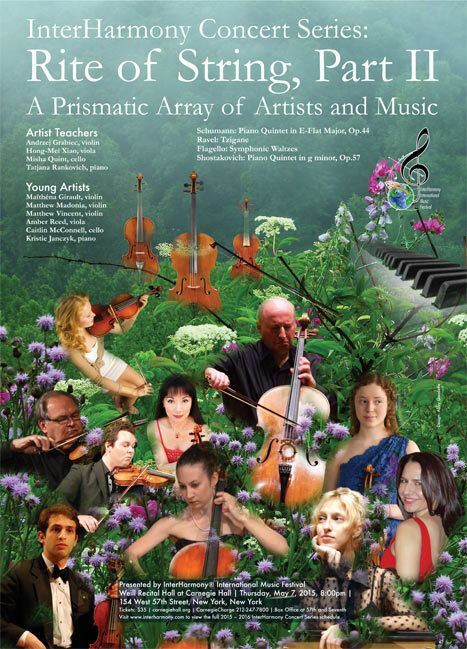 Every year, IIMF founder Quint brings a select group of rising young stars from the festival to play at Carnegie Hall with established performing artists. 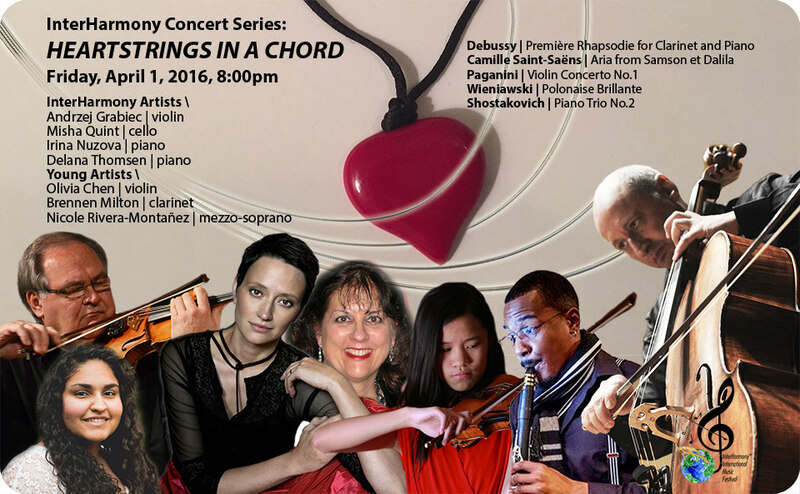 Tickets are $35, and can be purchased online at www.carnegiehall.org, or by calling CarnegieCharge at 212-247-7800. For more information, please visit www.interharmony.com. 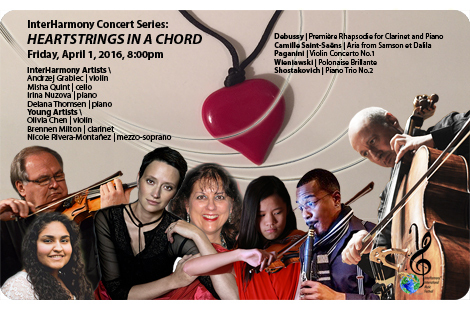 Heartstrings in a Chord brings together up-and-coming soloists with seasoned masters. In the concert's first half, meet a new generation of talented, classical musicians, as Brennen Milton (clarinet), Olivia Chen (violin) and Nicole M. Rivera-Montañez (mezzo-soprano) take to the stage with showpieces from Romanticism to Impressionism. The pianist for the first half will be Delana Thomsen. After the intermission, Festival Founder Misha Quint (cello) will be joined by Andrzej Grabiec (violin) and Irina Nuzova (piano) to perform Shostakovich's haunting Piano Trio. Debussy called the Rhapsodie for Clarinet and Piano "one of the most charming pieces I have ever written." Its dreamy atmospheres create a drama of changing colors, just beyond the reach of words. 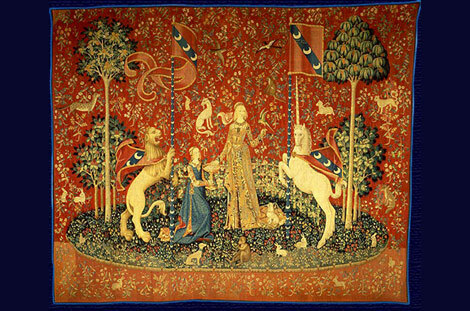 Delilah's aria Mon cœur s'ouvre à ta voix by Saint-Saëns, is so seductive that Samson cannot help but reveal the secret of his strength, dooming himself. Audiences have proved no less susceptible. In Stride la vampa from Verdi's masterpiece Il Trovatore, Azucena mourns her mother's awful fate and plots revenge. Wieniawski's Polonaise Brillante in D Major, is a theatrical, extroverted work, full of rapid runs and irrepressible enthusiasm. Paganini took care to write concertos so demanding only he could perform them and his Violin Concerto No. 1 in D Major, Op.6 remains one of the most difficult in the repertoire. But its staying power owes more to its wealth of melodies and operatic drama. Shostakovich's Piano Trio, No. 2, Op.67, strikes a tragic tone. The year was 1944, the composer's good friend Ivan Sollertinsky had died and the country was nearing the end of exhausting war. Here, after the public bombast of his Leningrad Symphony, was a private expression of doubt: anxiety about the future and sorrow for the past. Its premiere made a profound impression – the audience wept openly and demanded encores. It was immediately banned. DELANA THOMSEN is a highly accomplished solo and collaborative pianist who has given recitals throughout Europe and the US, as well as Master Classes in Iceland, Bulgaria, and the InterHarmony Festival in Italy. In NYC she has appeared in numerous venues including Alice Tully Hall and Weill Hall. Ms. Thomsen has been affiliated with Aspen, Juilliard and Mannes. She has been pianist for the violin classes of Ivan Galamian and for Master Classes of Dorothy Delay, Shirley Givens, Jean-Pierre Rampal, Eleanor Lawrence, Channing Robbins, Alan Harris, Leonard Rose and Mstislav Rostropovitch. "Morgunbildith" in Iceland wrote "artistic...a first-rate musician (who) projects unusually loveable playing"; The "Borba" in Bulgaria wrote "Ms. Thomsen plays with an authentic and sensitive style that gives the listener a sound picture of the boundless nuances of human life"; and "The Music Connoisseur" wrote "…the appealing duo displayed a high level of virtuosity throughout". She is a sought after teacher and inspiring mentor, and her pupils have had great recognition. Several have had the honor of being chosen to perform in Master Classes with distinguished artists such as Jerome Lowenthal, Edna Golandsky, and Robert MacDonald. Ms.,Thomsen's pupils have been the winners of numerous local & concerto competitions including Yonkers Philharmonic, Long Island Youth Orchestra, LaGuardia High School, & Hudson Valley Music Club. She is on the piano faculties of Manhattan School of Music Precollege, Hoff-Barthelson Music School and has private teaching studios in NYC and Columbia Co. NY. Her teachers have been Ruth Slenczynska, Arthur Balsam, Dalmo Carra as well as 13 years of post-graduate studies with Elizabeth Moschetti Tobias: assistant to Dorothy Taubman. OLIVIA CHEN is a fourteen year-old violinist and a 9th grader in the International Baccalaureate program at Richard Montgomery High School. Olivia began violin lessons at age of 4. She has studied with various teachers including Joyce Durfee, Henry Rubin, Herbert Greenberg, and Emil Chudnovsky. In November 2015, Olivia commenced studies with violinist and professor Victor Danchenko. At age 6, Olivia became a member of the string orchestra in the Houston Youth Symphony. She currently participates in the Maryland Classic Youth Orchestras (MCYO) as principal of the second violin in the Philharmonic, and is the youngest member of the orchestra. Olivia has played in master classes and lessons for various musicians and professors including Curtis professor Shmuel Ashkenasi, Julliard professor Shirley Givens, Baltimore Symphony Concertmaster Jonathan Carney, Michael Ludwig, Jody Gatwood, Olivia Hajioff, Marc Ramirez, James Stern, Rachel Barton Pine, and New Mexico Symphony Conductor and violinist Guillermo Figueroa. 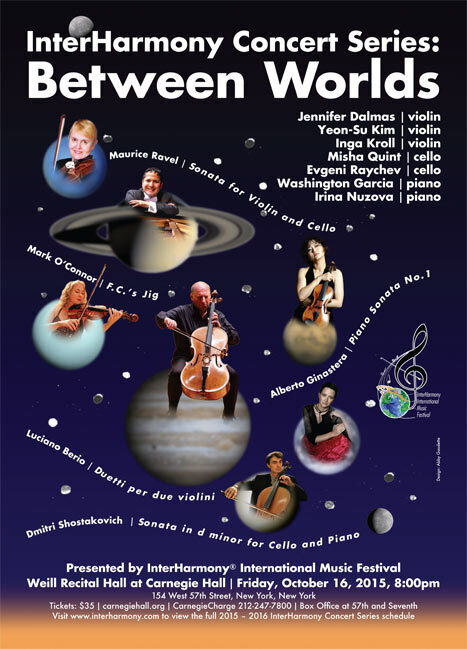 Olivia was featured in a special event hosted by the Symphony of the Potomac and conductor, Joel Lazar in November 2014 featuring works by Arvo Part. In the summer of 2014, Olivia won second place in the Junior Division of the Asian American International Competition. Later that year, she won third place in the American Protégé International Concerto Competition and was featured in a concert at Carnegie Hall in the fall. In March of 2015, Ms. Chen was selected to perform in the Music Friends Concerts at the Alden Theater in March 2015 and soon after won second prize in the Advanced Category of the WPAS Feder Memorial String Competition. This past summer, she attended the Miami Summer Music Festival where she studied with professors Michael Klotz and Yuriy Bekker and studied with Shirley Givens in the InterHarmony International Music Festival in Tuscany, Italy. Olivia won first prize in the ENKOR International Competition in July 2015 and as a result, she received the PASSAMONTE prize, which includes a scholarship to the LPM European Summer Masterclass in London in the UK. Olivia was one of the winners in the National Philharmonic Orchestra Concerto Competition and performed with the National Philharmonic Orchestra at the Music Center at Strathmore in a concert for second graders in Montgomery County Public Schools. Most recently, Olivia won first place in the state division of the Music Teachers National Association and competed in the eastern regional competition in January 2016. Clarinetist BRENNEN MILTON holds a Masters of Music Degree from the California State University Sacramento School of Music. He received a Bachelor of Music Degree from Alcorn State University, where he began his career as a freelance performer, playing Mozart, Strauss and even Dixieland jazz. After receiving his degree, Brennen went on to study music at the Naval School of Music, and graduated top of his class and won a job with the United States Marine Corp's 2nd Marine Division Band. As a freelance musician and volunteer he has performed with local groups such as the Sacramento Philharmonic, the Camerata California Orchestra, the Capitol Pops Concert Band and the American River College Orchestra and Symphonic Wind Ensemble, Mr. Milton has branched out into the Northern California freelance scene, performing with the VITA Academy orchestra, pit orchestras, and even unconventional spaces such as the storefront of a local sandwich shop. Brennen made his debut as an international clarinetist in Italy in the Summer of 2014 with the Tuscia Opera Festival in Viterbo, Italy. Brennen made another appearance in Italy this summer for a classical music festival in Tuscany. In March 2015 Brennen won the Concerto Competition at Sac State, and performed as soloist with CSUS's Symphony Orchestra with Debussy's Premiere Rhapsodie. Born in Carolina, Puerto Rico, mezzo-soprano NICOLE M. RIVERA-MONTAÑEZ is demonstrating her artistic versatility on the operatic stage, as a member of premier chamber choirs, and as a soloist. Nicole's pursuit of a professional music career began at the age of 14 under the vocal training of Alicia Stagner. At Dr. Phillips High School in Orlando, Florida, she broadened her musical education through the Visual and Performing Arts Magnet Program. There, she participated in numerous ensembles, festivals, and conventions, including both the Florida and the Southern Division American Choral Directors Association (ACDA) conventions and the Florida All-State convention. Nicole chose to continue her education at Stetson University in DeLand, Florida, pursuing both a Bachelor of Music in Vocal Performance and a Bachelor of Arts in Psychology. At Stetson's School of Music, Nicole is a scholarship student of Russell Franks, Director of Stetson Opera Theatre. She is a member of several ensembles including Stetson University's premier Concert Choir, under the direction of Timothy Peter, in which she performed in New York City's Alice Tully Hall, Lincoln Center in the spring of 2014. On the operatic stage, she was cast as the understudy for the role of Idamante in Stetson Opera Theatre's 2015 production of Mozart's Idomeneo. As a soloist, Nicole has also had the opportunity to perform in the master class with Pulitzer Prize and Grammy Award-winning composer William Bolcom and his wife, mezzo-soprano Joan Morris. In April of 2015, she was named the third-place winner of Stetson University's prestigious H.M. Giffin Vocal Competition. In addition to her involvement at Stetson University, Nicole has branched out with performances in other Florida cities. In 2014, she was an ensemble member in Vero Beach Opera's production of Mascagni's Cavalleria Rusticana. She also serves as alto section leader at Ormond Beach Presbyterian Church. Nicole has excelled in both her music and academic careers, receiving several scholarships and awards including the William E. Duckwitz Talent Scholarship and the School of Music's Outstanding Freshman Award. She is also involved in many organizations, including the Stetson Music Teachers Association, as well as the National Honor Society in Psychology (Psi Chi).